Expand – REDI | Regional Economic Development Inc.
REDI works with existing Columbia and Boone County employers on retention and expansion strategies, including workforce development, labor availability analysis, and state incentive programs. REDI also coordinates the county’s Certified Work Ready Community effort. REDI actively recruits business support and encourages job seekers to earn the National Career Readiness Certificate. 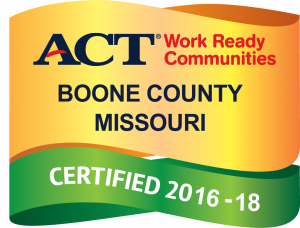 The program helps current employers find qualified employees, and showcases Boone County’s strong workforce to prospective businesses. REDI coordinates site tours to existing Columbia and Boone County businesses that include the REDI president and executive vice president, the city manager, the Chamber of Commerce president and interested City Council members. If you would like to schedule a visit to enable community leaders to learn more about your business and what we can do to support it, please contact REDI Executive Vice President Bernie Andrews at 573-441-5541 or bka@gocolumbiamo.com.